He is known for interceding for us for protection from evil and for healing. In Christian art, he is often depicted wearing armor, wielding a sword or spear and slaying a dragon, a serpent or satan. The Catholic church refers to Michael the Archangel as St. Michael even though he is an angel, and not a saint whose recognition resulted from canonization. He is believed to be the prince of all of God’s angels, and the protector of the church. As a sword-wielding angel who introduced himself to Joshua just before the fall of Jericho, as commander of the army of the Lord. In the Epistle to the Thessalonians, mention is made of an archangel who will announce the second coming of Christ. Though not identified, it is believed to be referring to St. Michael. St. Michael is venerated as a healer, and protector of the Catholic Church. His feast day is celebrated on Sept. 29 but we are praying the novena in February. St. Michael the Archangel, we honor you as a powerful protector of the Church and guardian of our souls. Inspire us with your humility, courage and strength that we may reject sin and perfect our love for our Heavenly Father. In your strength and humility, slay the evil and pride in our hearts so that nothing will keep us from God. St. Michael the Archangel, pray that we may be blessed by God with the zeal to live our lives in accordance with Christ’s teachings. St. Michael the Archangel, pray that we may have the grace to see the image of God in the least of our brothers and sisters. St. Michael the Archangel, pray that we may be protected from the snares of the devil, that we may avoid all occasions of sin. St. Michael the Archangel, pray that we may have an overwhelming desire to humble ourselves before God in service to His Will. 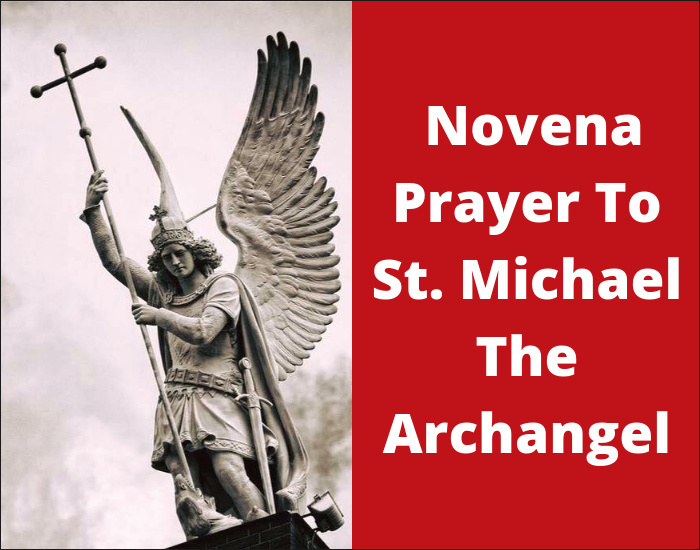 St. Michael the Archangel, pray that we may have the moral strength to defeat disordered desires and passions that would take the place of Almighty God. St. Michael the Archangel, pray that we may have the faith to truly entrust our lives to the loving care of our Heavenly Father. St. Michael the Archangel, pray that we may have the grace to joyfully dedicate everything that we do to the greater glory of God. St. Michael the Archangel, pray that we may have the will to faithfully obey God in all of his commandments. St. Michael the Archangel, pray that we may have the grace to share eternity with our Heavenly Father. St. Michael the Archangel, you are the prince of angels but in your humility you recognized that God is God and you are but His servant. Unlike satan, you were not overcome with pride but were steadfast in humility. Pray that we will have this same humility. St. Michael the Archangel is the patron saint of grocers, mariners, paratroopers, police, and sickness.